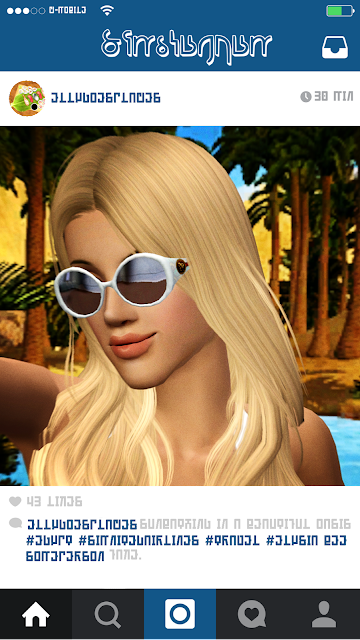 She feels a pang of jealousy when she sees Elysia’s newest upload: a picture of herself perfectly framed in front of a beautiful Egyptian oasis, no doubt the result of her newest travel writing gig. “Do you think I’m boring?” Luna turns off her phone and tosses onto a nearby shelf, out of reach so she won’t be tempted to check Simstagram again. “If you’re hanging out with the likes of me, chances are that you’re not very exciting,” Crimson’s reply is dry. He doesn’t look up from the computer screen. Luna’s newest book, The Initiative, is in dire need of proofreading, and he’s here to help with that. He’s been to her house several times now, after a few cautious weeks during which they only met at cafes and parks. Soon Crimson becomes an awkward fixture in the household. 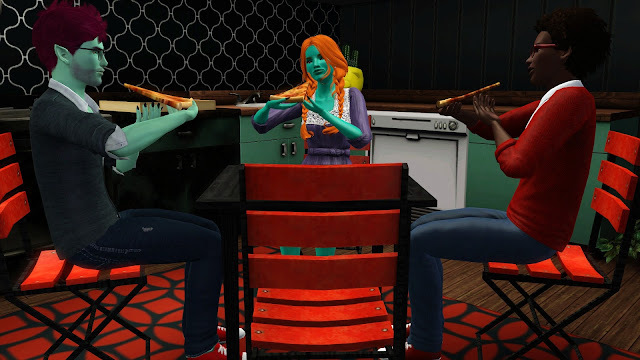 Quentin works from the late afternoons (pre-performance practice) to the late evenings (post-practice performance), and Crimson occasionally joins the couple for a quick bite to eat. At first, Luna had to beg Quentin to stick around whenever Crimson came over. He wanted nothing to do with “the creepy stalker,” as he called him. However, it turns out the two share a lot in common: First, a love of pizza. Second, a love of a couple of obscure ska bands. Okay, so they shared two things in common, but that was enough for them to bond. Quentin is, after all, a friendly person. Furthermore, he can tell his girlfriend needs some sort of stable source of social interaction. He has his band members—all of whom he’s close to—but other than him, Luna has no one in Aurora Skies. 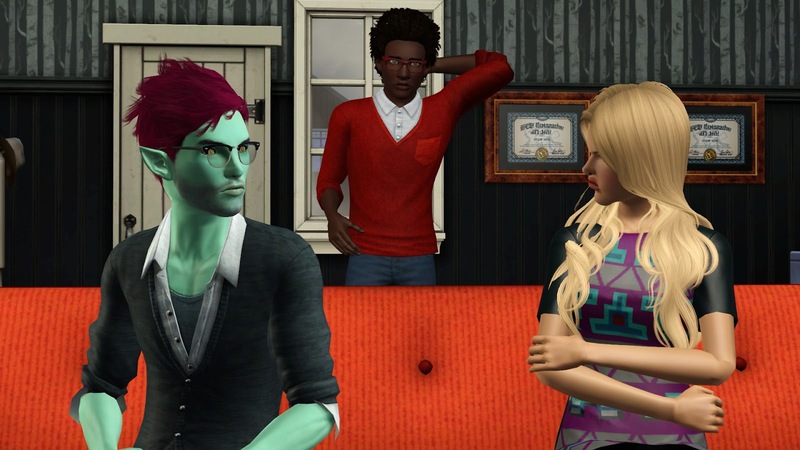 And as much as she denies it, she obviously misses her strange family, and strange Crimson seems to remind her of them. Thus, the two men discuss their favorite bands over pizza every Tuesday after Quentin gets off of work, a concerted effort by both parties to come to some sort of common ground. And their common ground culminated in a heated discussion about a particular band. “Yes, Hoboken Days was definitely a formative album for Lamppost Propaganda—but Elsewhere in the Midst is a much better representation of the artist’s struggles with existential crises,” Crimson made his point with a mouthful of pizza. “That’s not the point I’m making, bro. Hoboken Days is raw in a way that LP’s later albums never are, and that’s what being an artist is about: raw emotion,” Quentin was adamant. The only ska band Luna knows is Yes Trust, so she felt very left out of this conversation. She made an ugly face while she tries to think of some way to contribute. “Boo! Hiss!” Crimson actually said “hiss” instead of hissing, so it doesn’t have its full effect. And so Luna occasionally feels like a third wheel to her boyfriend and her best friend. 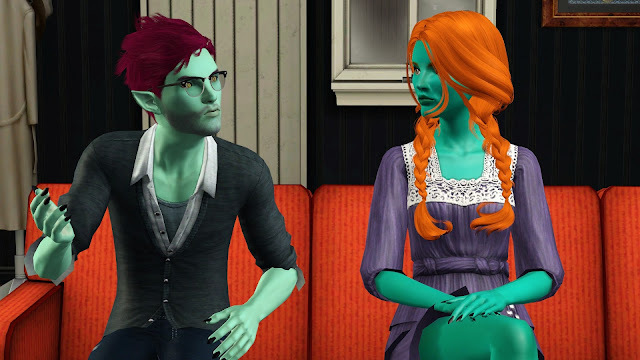 Tonight is a Monday, though, so it’s just Crimson and Luna since Quentin has a standing friend-date to go out with the band after their performance. The two sit in silence. Some nights are full of exuberant conversation and others are just like this: quiet, Crimson reading Luna’s work and Luna’s mind running amok. “It’s good,” Crimson says thoughtfully, “Different from your last book, but I think that’ll deter you from a sophomore slump.” He stands up and stretches, but says nothing else. Luna is disappointed--she’d like to either be showered with praise or given constructive criticism--but she also understands the drained feeling that accompanies an intense proofreading session. 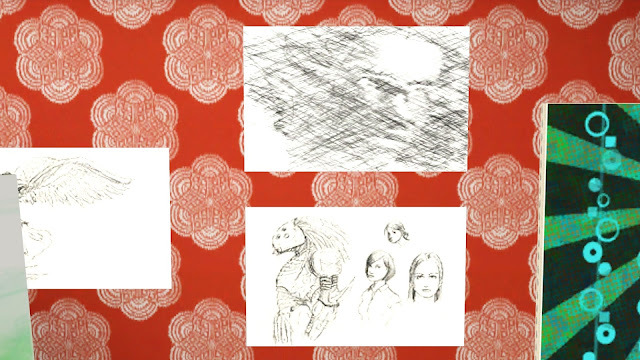 As Crimson stretches he studies the drawings pinned up on the wall. There’s a couple of sci-fi themed drawings, and one that looks like a chaotic array of lines. He stares at it for a moment, until Quentin’s face comes into focus. "I know got a bromance brewing, but I don't think you’re his type." Crimson ignores her comment. "You don't ever get jealous of other women?" Luna is taken aback: not only is it a pointed question, but it’s surprisingly astute. She sees how strangers look at her and Quentin. He's cute for sure. And then there's her: unsettling, awkward. Ugly. Even if Quentin finds her attractive, it’s not because she’s conventional looking. “Sure,” Crimson should probably be annoyed at how often Luna asks him to stay late while she waits up for her boyfriend. He’s happy to do it, though. Anything to spend more time with her. Truthfully, his feelings for her have subsided and exist mostly as a low-level crush: it’s nice to fantasize about, but he understands nothing will ever come of it. He’s content with friendship status. While Luna busies herself making--in Crimson’s opinion--coffee that is far too strong, he sits on the couch and looks out the window. The house looks so different from the inside. His mind wanders back to that night, standing out in the cold, looking in through the ice-covered window. He’s tried to force that memory out of his mind, but it resurfaces constantly, and it’s always accompanied by excitement, shame, and regret. Whenever Crimson falls deep into thought like this, his eyes glaze over and he becomes very still. It’s unnerving to some, but Luna has quickly gotten used to it. “Sure,” Crimson--the alien born on a different planet and raised with a completely different set of cultural norms--snorts. Crimson gives her a skeptical look. His father used to rant at him and his sister about his top secret, cognition-centered projects. He even had them undergo testing and training, but it amounted to nothing. What a waste of time. Crimson’s playful teasing is interrupted by the doorbell. Luna rises from the couch and walks softly to the door, trying to be quiet in case it’s a stranger and she has to pretend she’s not home. After all, only a murderer would ring her doorbell this late at night. Her jaw drops when she peeks through the peephole. She throws open the door. “Surprise, sister!” It’s Elysia, in the flesh and very much not in Egypt. If this wasn’t Luna’s real life, she would think it was some cheap narrative trick to bring characters together purely for strife and discord. “Yeah, I wrote the book. It doesn’t mean I actually backpacked across France,” Elysia laughs, as if that’s an obvious conclusion to make. Crimson feels incredibly awkward sitting here listening to this trainwreck of a story. He wonders if he should excuse himself, or if he should just leave without saying anything. “I thought you were getting paid to do that? Why didn’t you go?” Luna would love to be paid to go on vacation. “Were you fired?” Luna can’t believe her sister. Elysia has always been arrogant, but she’s never been this criminal about it. Sounds like you could use a vacation, Crimson thinks, smirking. Elysia shoots him a dirty look. For a moment, his heart skips a beat. Could Luna be telling the truth? There’s only one way to find out, so Crimson conjures the most obscene image he can think of and waits for Elysia’s reaction, but it doesn’t come. Luna smiles, delighted to hear that her sister thinks so fondly of her. “I suppose it helps that Aurora Skies is so remote and so bureaucratic that extraditions for petty crimes are rarely approved,” Crimson finally speaks. Luna frowns, disappointed to realize that her sister has an ulterior motive. “I’m sorry, who are you?” Elysia sneers as she sits on the couch next to him. She glares at him as she concentrates as hard as she can. It doesn’t take her much effort to verbally eviscerate someone--usually, it only requires a quick dip into her opponent’s mind so she can find some embarrassing secret or a fear. Trying to get deep into Crimson’s mind, though, felt like swim in tar pits. She can tell his mind is a mess, but it’s a mess that’s on lockdown. “Elly, stop--” Luna tries to intervene. “I know what you did is probably a felony,” Crimson sneers back at her. His infatuation with Luna is now balanced out by his contempt for her sister. “Hey, that’s not cool--” Luna is interrupted again. The two are so busy staring each other down, they don’t notice Quentin enter the door behind them. 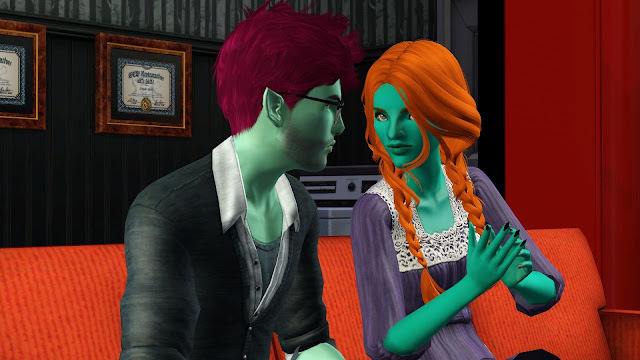 Quentin likes Elysia okay, but he always feels awkward around her. How often does she read his mind? Is it constant, or does she have to actually concentrate on reading his mind? Has she ever read his mind while he’s thinking about other women? He can’t help it—he’s a red-blooded man. He’s bound to think about someone like Kim Kardashiasim. He’s only human. That doesn’t mean he isn’t completely devoted to Luna. I am completely devoted to Luna, he thinks loudly. “I think it’s time for me to go,” Crimson says as he stands up. “Oh, no,” Elysia jeers mockingly, “you’ve been so much fun!” She follows him to the door as she taunts him. “I’m sure. I look forward to your visit. Just what Aurora Skies needs--another cold front,” Crimson cringes at his weak insult, and for a moment Elysia can make her way into his mind. A familiar sense of self-loathing crashes over her. It was weird to feel it coming from—and directed at—someone else. “Okay. Drive safe, buddy,” Quentin is disappointed that Crimson is leaving so soon.Backup would be nice, but he respects Crimson’s decision to retreat. “Honey, could you make up the couch for Elsyia? I’m going to go to bed,” Luna’s voice is tired. She wonders if there are any hotels in Aurora Skies. And so Luna and Quentin have a new houseguest. Author’s note: For those who need a reminder/didn’t read my last legacy: Elysia is a telepath, as is Lily Aquila, Luna’s stepmom. Crux discovered from Quentin’s dad, Lawrence (who was an evil businessman), that Alcyonian-Human offspring have the potential to be telepathic. 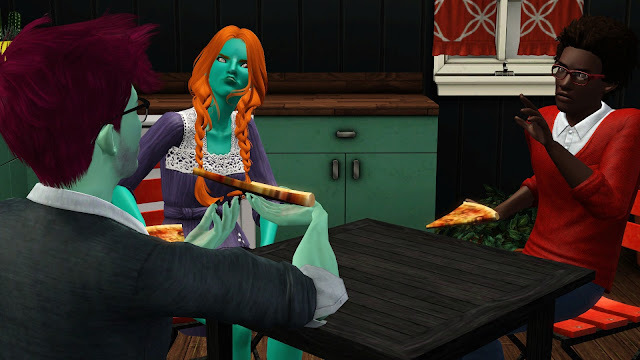 I honestly don’t remember why I wrote telepathy into my previous legacy, but it’s there so I’m going to use it for storytelling purposes (ooooohhhh, that was probably why I wrote it in). In game notes: Quentin is level 6 of his career, and Luna has actually published six books. 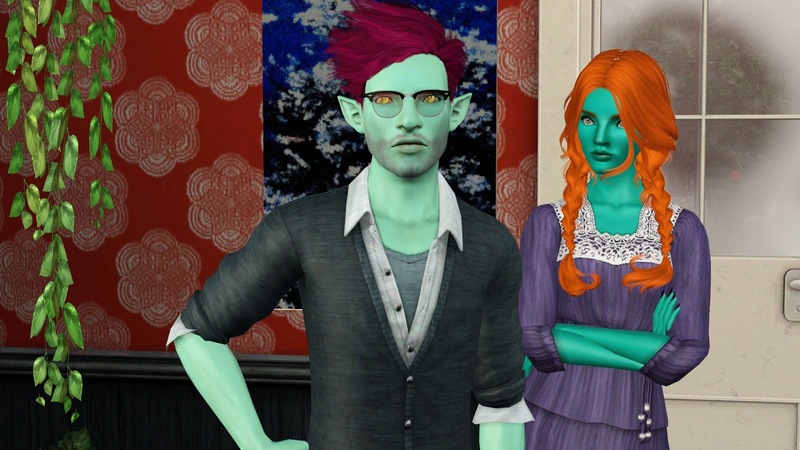 They both have to have hobbies as per their rolls, so Quentin gardens and Luna paints and sketches. She collects gemstones for her “My Precious” goal and they are on display by the front door (you can see them in some of the pictures). You may have also noticed that there is some fire damage in the kitchen--Luna set the kitchen on fire again. ... I feel like Crimson is up to something. That conversation about whether or not Luna was jealous of other women is suspicious. Elysia! Oh dear, she's got herself in a spot of trouble, hasn't she? Maybe if she had just gone travelling... Anyway, I can't wait to see what happens. I feel like Elysia staying and Crimson being over has something to do with your rolls. Full house or indecisive couple+friend? Polly set the kitchen on fire twice in the story, but like a million times in my actual save file. XD I think Luna has set it on fire three times total. I have her cook while Quentin gets ready for work, but I might just pass the chore over to him. My roll actually is just couple. I wish I had full house! That would be incredible. 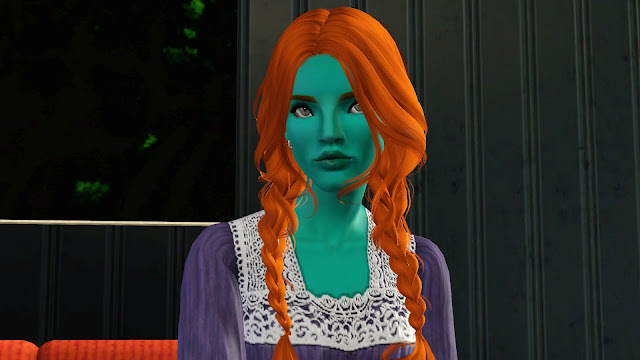 I wrote Crimson in for a specific, soon-to-be-revealed reason, and Elysia is here because I'm a selfish sim goddess and I miss her. ;_; Crimson and/or Elysia might contribute to the next generation's rolls, depending on how the heir vote goes. I wanted Elysia to be a good foil to Crimson. She might stick around for awhile because I feel like Luna needs friends and family around. Oh, Elysia is back then I guess? Not surprised that she was fired, even if she just did what a lot of the social media princesses do. I like how she treated Crimson; she's absolutely viscious when she wants to. And aweful, but mostly just fun. Nice negging there by Crimson by the way. Bet he's read "the game". Yes, she's back.....for now. I love Elysia because she's vicious and awful and fun. Writing just Quentin and Luna is kind of boring, so she's going to make it more interesting for me. Elysia and Crimson are gonna bang. Calling it. I'm glad their friends now. And that Quintin is slowly coming around. Luna set the kitchen on fire again. *snorts. Sorry. Yeah, back to the story now. Okay. I guess we can trust Crimson a little then? Maybe. I'm still going to keep an eye on him though. Almost every other Alcyonian who's made it to the world inhabited by Polly and Co. have been twisted and kinda insane-o. So... Yeah. lol. I see Elysia's on my side with Crimson. Ha! Poor Quentin though. That's a lot to have thrown at him walking into his own door. I finally bought the Fireproof Homestead LTR because it was getting ridiculous. She was the primary cook because I was having Quentin skill up for his job, but it got to the point where I couldn't trust her with the stove. We can trust him a lot! TBF, Polly is kind of crazy, too. I feel like Quentin is the one normal person in my universe. Haha, he really is though! He just has a crush on Kim Kardashiasim. XD And I should've named Luna's sister "Sun" or something because they're really opposites.